We returned to one of the kiddos' favourite malls again recently! 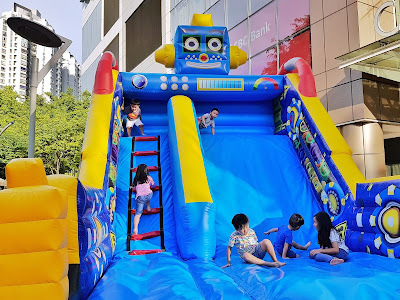 The one that is connected to a Farrer Park MRT Stations, that has an outdoor playground they loved and an operational choo-choo train too? Yes, that's City Square Mall where the Autobots had invaded this Christmas! 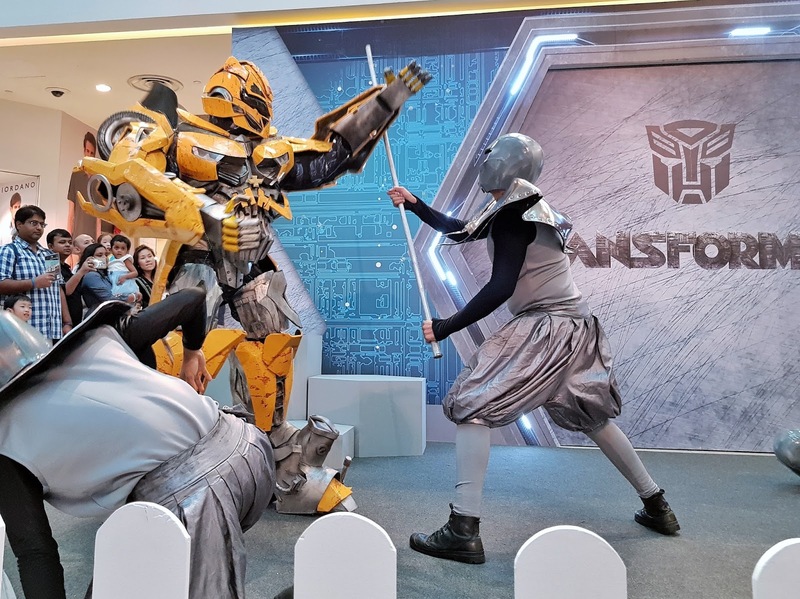 Join the Transformers in their bid to save humanity in the first ever Transformers ‘LIVE’ on stage in Singapore! 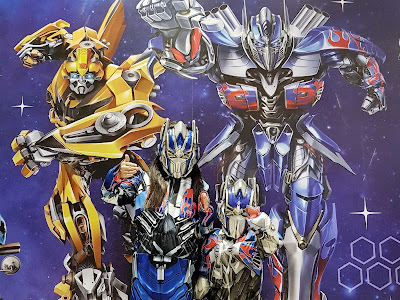 Featuring fan-favourites Optimus Prime and Bumblebee , and introducing delightful new characters, this will be a show just under 20-minutes you would not want to miss! 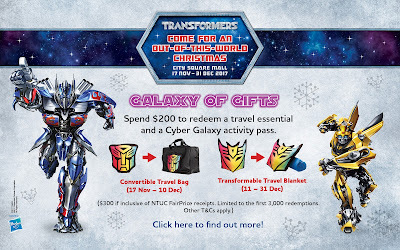 Experience the ultimate Transformers Meet and Greet at City Square Mall this December! 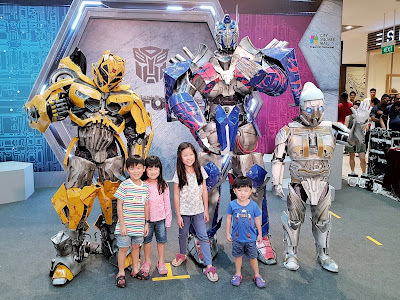 Spend a minimum of $50 to redeem a Meet The Autobots pass 1 hour prior to each show, and get up close and personal with your favourite Transformers action heroes after every stage show in their first public outing. Limited to 50 passes per show. 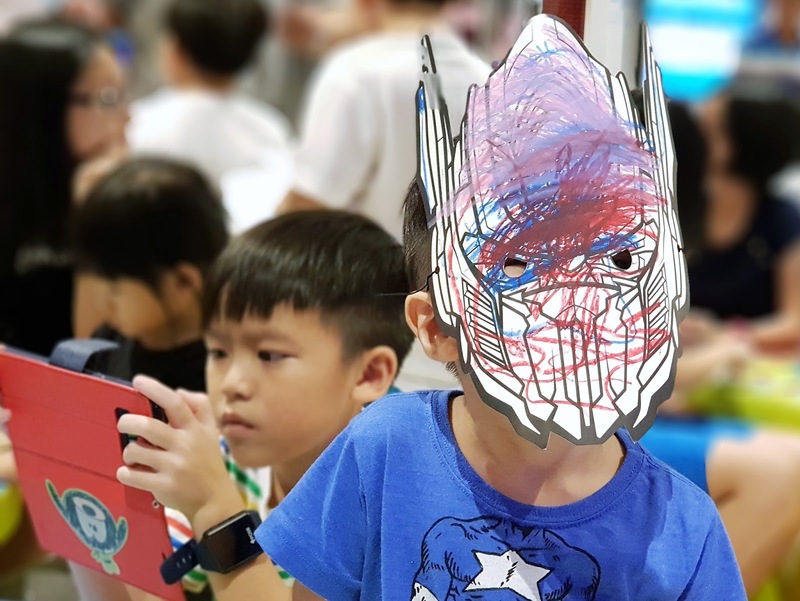 Transform into your favourite Cybertronian heroes by decorating your own Transformers mask! 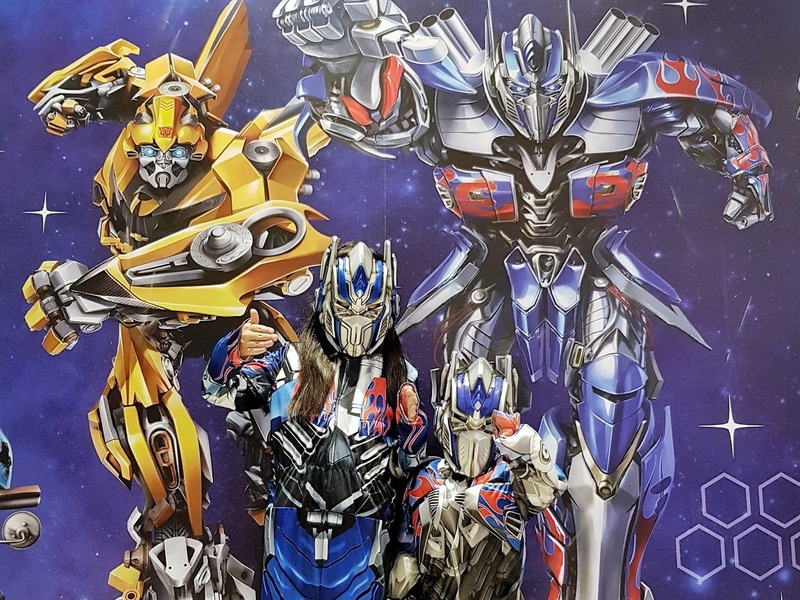 Don’t miss out on a photo opportunity in Optimus Prime and Bumblebee children’s costumes with a Transformers photo station framing the shot! 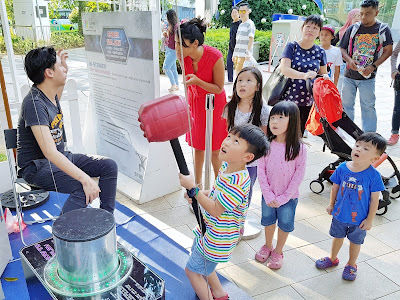 Take note that a pass allow the whole family to take a photo but the mask entitlement is only 1 per pass. I would have been disappointed with the mask decorating if it wasn't just an extra activity with the photo pass. City Square Mall brings reel to reality with life-sized Transformers statues brought in from overseas for visitors to snap memorable photos with and join their Facebook photo contest to win attractive shopping vouchers! Be immersed in a unique galaxy-like Christmas experience like no other for the entire family, as the set comes to life with smoke and laser. Gather your friends and family and come down to City Green Park for an exhilarating Christmas carnival! With carnival classics like bumper cars, inflatable slides, and obstacle courses to choose from, it will be tons of fun for all! 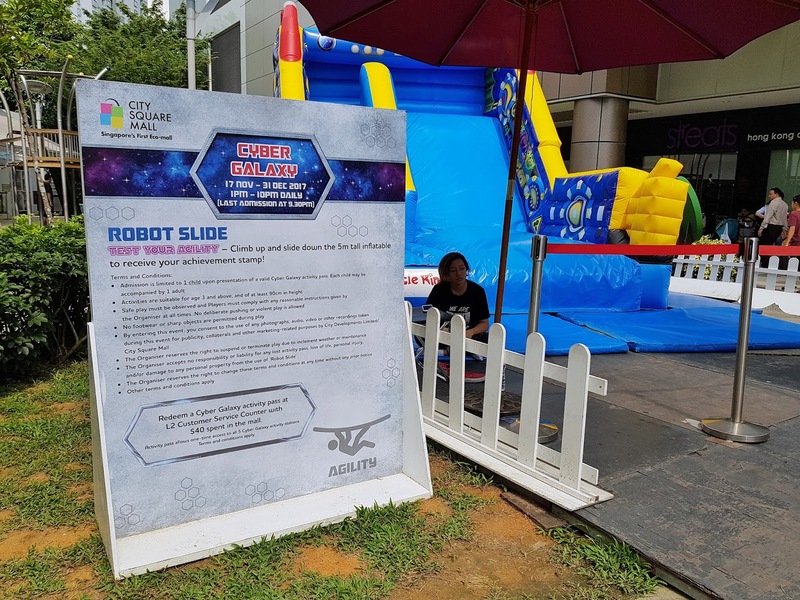 Redeem a Cyber Galaxy activity pass at the Level 2 Customer Service Counter with a minimum spend of $40 at the mall to enjoy all the fun and games. 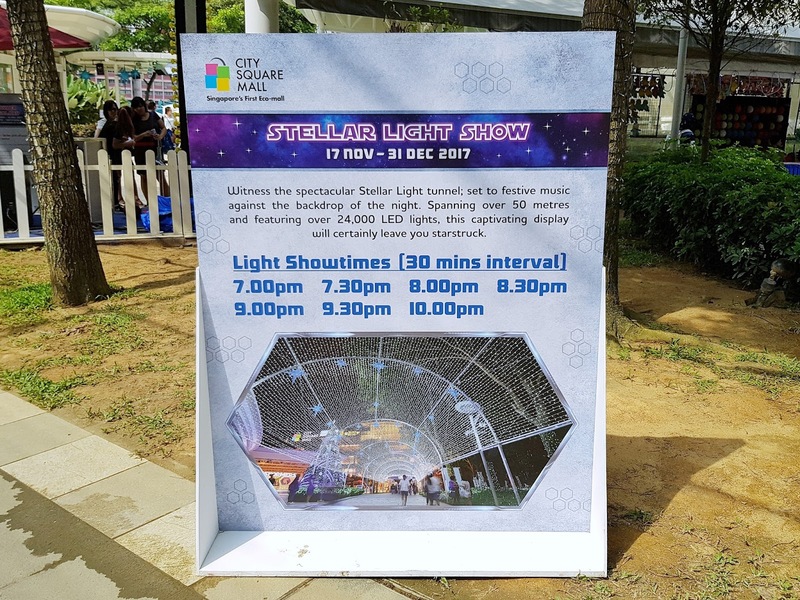 City Square Mall transports you into a starry universe this festive season, a very first in Singapore. 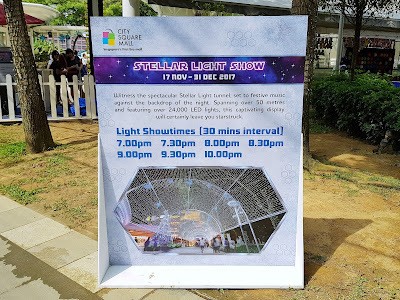 Explore a tunnel of stars and gather under the action-packed visual display of lights and music with your loved ones and witness the stunning 10-minute light show of your dreams! 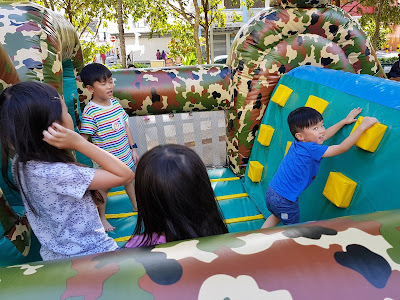 We did not stay for the show but from the photos we saw online, this "tunnel" is surely a great place for photos in the evening! 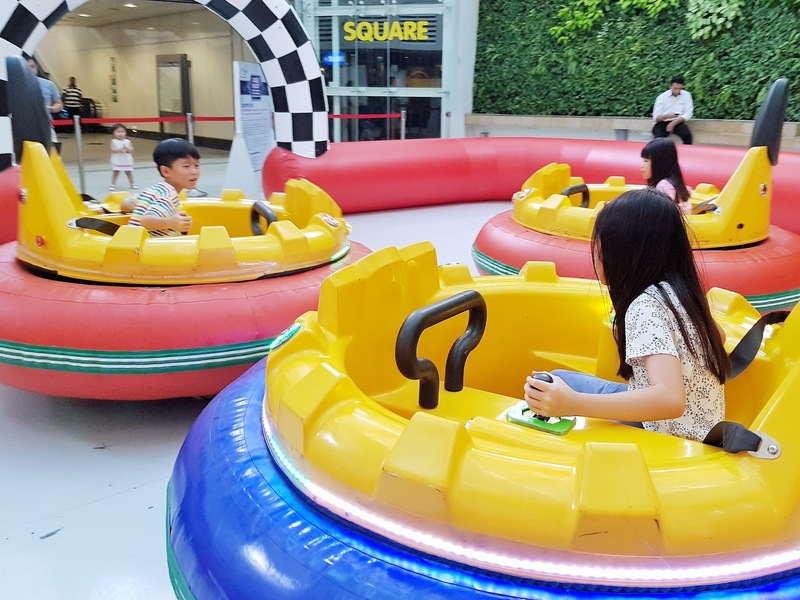 Feel the magic of Christmas when you head down to City Square Mall to have a blast in falling snow with the kiddos. 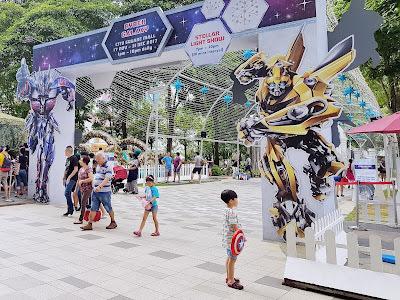 Be transported into a new universe both familiar and new, as you take in the sights and sounds of the season. 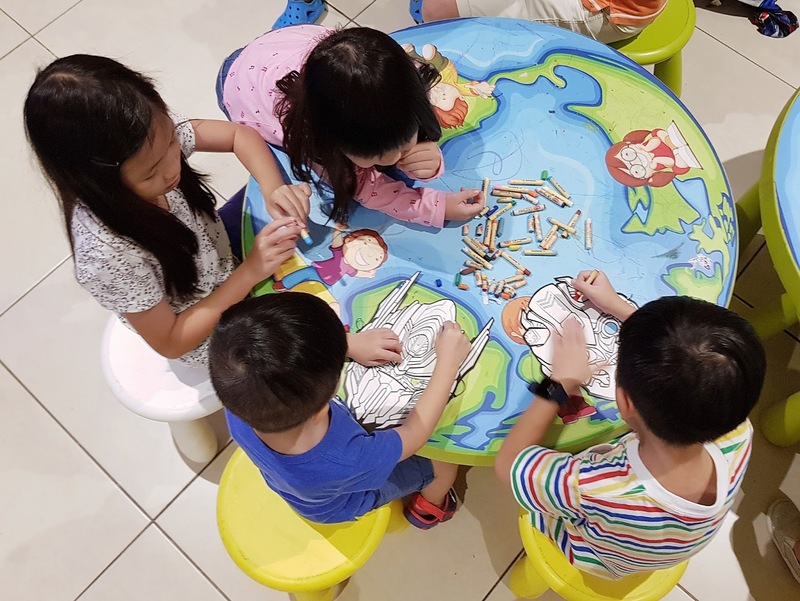 Christmas simply is not Christmas without carols! Join the Emmanuel Choir as they share season’s greetings with the gift of music. Fala-lalala-lala-lala! 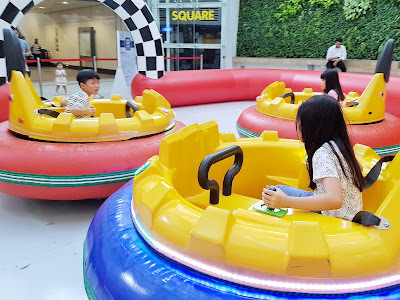 Check out the following on what you are entitled too when you do your shopping at the mall! 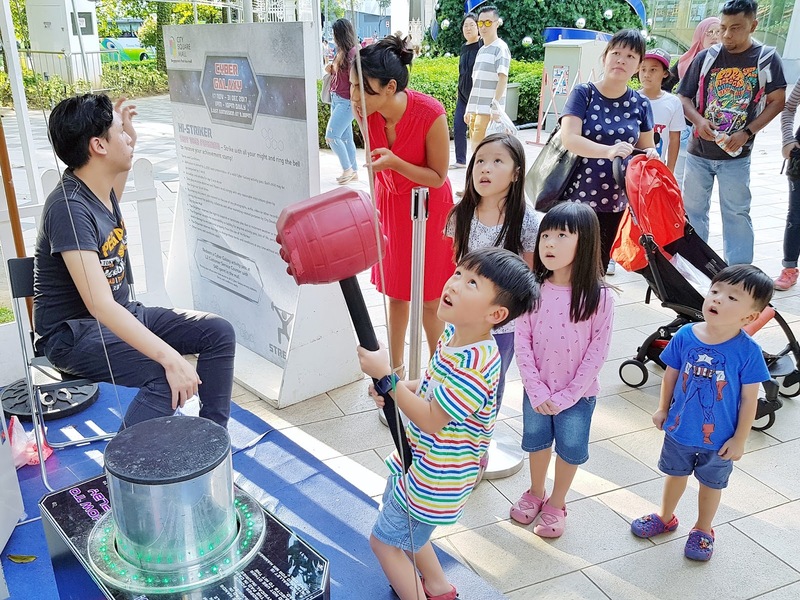 With a minimum of $40 spent, shoppers can redeem a Cyber Galaxy activity pass to the Cyber Galaxy carnival at City Green Park. With a minimum of $50 spent, shoppers can redeem a Meet The Autobots pass, where they will be able to take photographs with the Transformers character mascots on stage and access the mask-making workshop at Basement 2 to design their own mask as a souvenir. Limited to 50 passes per show. With a minimum of $200 spent, shoppers will be entitled to receive a travel essential and a Cyber Galaxy activity pass ($300 if inclusive of NTUC Fairprice receipts): Convertible Travel Bag (17 Nov – 10 Dec 2017) and Transformable Travel Blanket (11 – 31 Dec 2017). 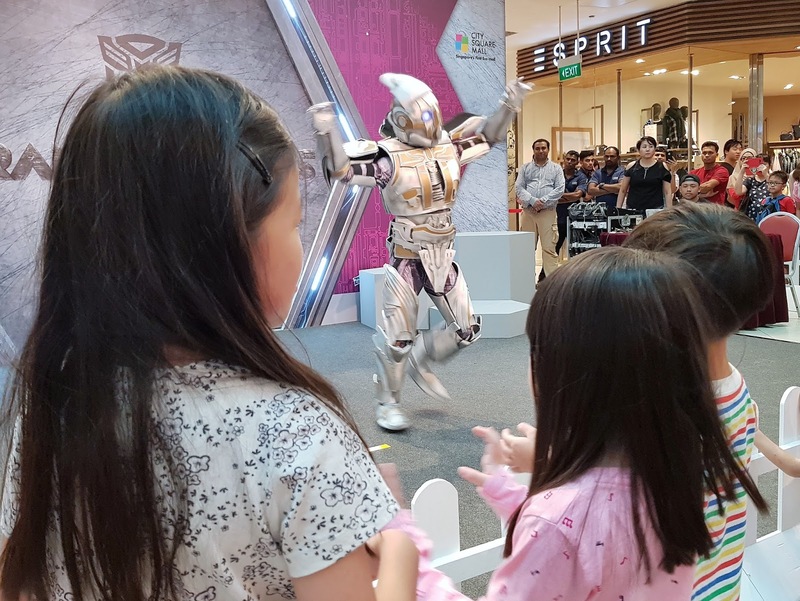 Complimentary add-on : With a minimum spend of $200, shoppers will be entitled to purchase $50 worth of City Square Mall vouchers and receive a complimentary $5 voucher. 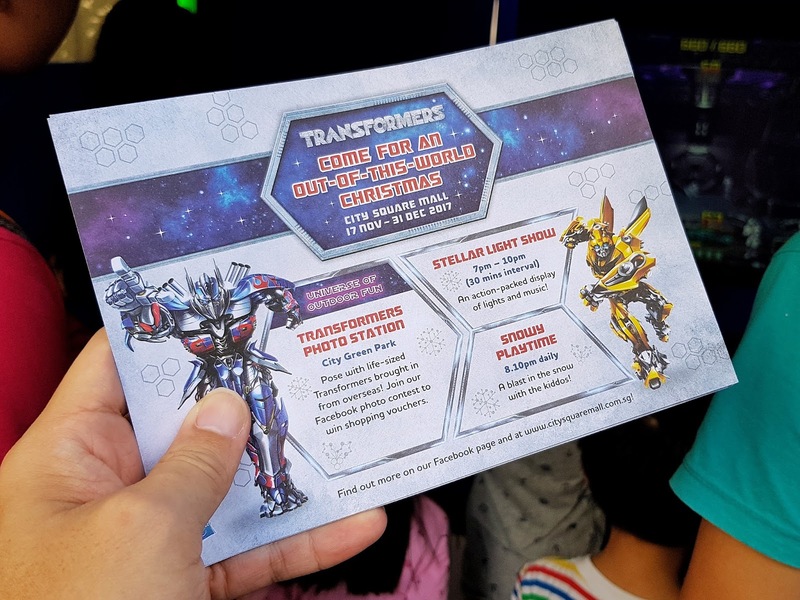 Limited to 50 redemptions daily during the campaign period, while stocks last. For more details on the activities and promotions, visit www.citysquaremall.com.sg or check out City Square Mall’s Facebook page. Thank you for inviting us over for the fun activities City Square Mall!